It turns out, social media marketing doesn’t have to be same old, same old. More often than not, you scroll through social feeds or streams and see a celebrity or other popular user of the platform promoting an item by holding it or standing near it, with a bland smile and generic copy pasted into the photo’s description. Now, of course, not every sponsored post plays out like this. But a lot do. And where’s the fun in that? Through a new campaign, which launched last September, Viktor & Rolf took its Flowerbomb fragrance brand into the 21st century. The company combined brand messaging, hints of surrealism and whimsicality, and nodes of dreaminess, and created something exciting and new for influencers. Instead of shipping various influencers bottles of their fragrance, Viktor & Rolf worked with influencer marketing platform Fohr Card to carefully select influencers who “match our consumer and embody our brand,” Laura Azaria, vp of marketing for European fragrances at L’Oréal USA, told Adweek. Instead, Viktor & Rolf worked with various designers and the influencers themselves to create a lush flower-scape for influencers to interact with and eventually post on their own social channels. “It was the perfect campaign for me to work with,” said Katie Rodgers, also known as @paperfashion on Instagram. Rodgers started to post her art online in 2009 while working full time before eventually quitting her job to pursue her own work a few years later. “This totally captured the dream worlds that I try to paint, but it was IRL [in real life],” said Rodgers. Her fans seemed to agree. In fact, a few of the #flowerbomb influencers saw more engagement on those particular photos than their usual posts, as reported by Fohr Card who managed the campaign. Rodgers saw a 45 percent increase over her normal engagement. Jeanne Grey, who posts on @thegreylayers with lifestyle and travel content, saw the highest engagement of the campaign, with 5.82 percent. Grey, as her name might suggest, typically posts in a fairly monochromatic aesthetic. This wasn’t on purpose, her intentions weren’t to attract all her 194,000 followers with some kind of dulled beacon. A lot of Instagram profiles can become popular due to their consistent theme or overall color scheme; curating your Instagram feed, and choosing who to follow, is just as intimate as deciding what to post. To that end, viewing your feed is like dipping into your own private space that you got to decorate just how you like. That’s what makes social influencers so powerful. Their fans, or audience, have chosen specifically whose content to pay attention to, whether its funny memes or twee photos of barns. Influencers understand how important that relationship is, and they don’t want to abuse that trust. article on THE SPRUCE featuring us on their top 10 florists to follow on IG! "What do you get when you cross Stone Fox Bride, The Black Tux, and Time Inc.’s The Drive? A killer collection of classic Just Married cars adorned in pom poms, feathers, and flowers—plus a crew of smoking-hot automotive experts dressed in their Sunday best....."
Shane + Nancy had the most magical intimate wedding on the Manhattanville College campus, photographed by The Ramsdens.
" At one point or another it seems every little girl falls in love with the magical world of flowers, fairies and wood nymphs. 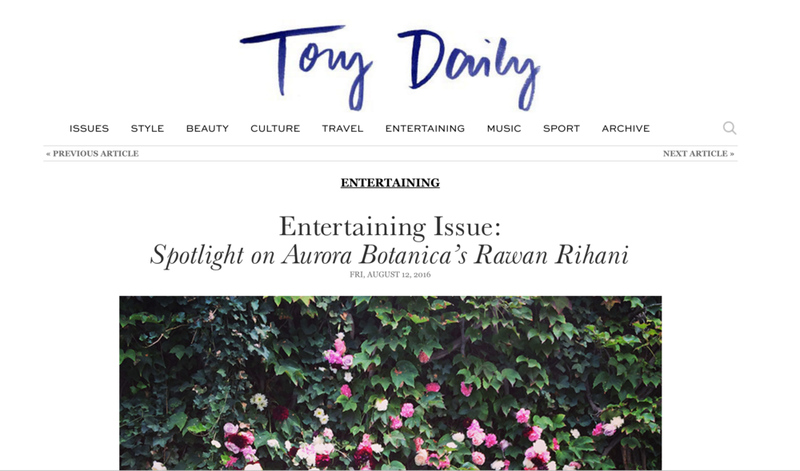 As a result, it’s no surprise that Rawan Rihani, the Brooklyn-based designer and floral artist, has hit a Proustian nerve with her company Aurora Botanica, whose signature look, ethereal crowns made out of blossoms and berries, seem to be appearing at all the chicest weddings and events around town. Here, Rihani tells us a bit about her inspirations, gives us some tips for setting a summer table and shares the most important rule of thumb when it comes to creating an arrangement at home. " February's issue of Vogue Magazine features our flower installation in their "Shakespeare in Love" index. A beautiful story curated by Chloe + Mint, photographed by Ryon Lockhart Photography on a jewel toned palette moody but happy. Click through to see the full feature on 100 Layer Cake. “An unexpected element makes something feel fresh—that’s great fashion,” says Rawan Rihani, NYC floral designer and owner of Aurora Botanica. With her signature twist of painterly and playful, wild and couture, she designed this floral necklace just for us—a DIY accessory that will take any outfit to a whole new level. Granted, this is jewelry with a limited lifespan…(you’ll want to make it the day you wear it). But the impression it makes? The photos? They’ll be the stuff of style legend. “At the market, I go in as if I’m working with art. I pick a flower because of its color and form; I see what I’m drawn to, and then I see what I can create. I’m also a fan of beautiful smells, and I always play with light and color." You’ll want blooms that can last a while without water. Favorite non-wilters are orchids, dahlias, freesia, strawflowers, spray roses and anthurium. Refrigerate between making and wearing it—ideally happening on the same day—and it should last for a whole evening out. Click through for the DIY steps! "What is a florist’s favorite flower? A florist’s favorite flower or anyone’s favorite flower is one that captures your heart. I go through flower crush phases, for instance last year, I was crazy over dahlias + ranunculus (deep + dramatic feeling flowers) , and this year I am more of a hellebore, clematis + poppy (softer +lighter hearted) type of gal! When did flowers begin calling your name? I’ve always felt super connected to nature + flowers, and always used them as source of inspiration for art. Flowers always had my heart. But it was really when I picked up a few shifts at Sycamore Flower Shop + Bar in Ditmas Park, that I fell in love with working with flowers. As an artist + designer, I felt like I found the perfect medium because not only can you play with color, texture, mood, composition but you are also working with a medium that is also alive and has a vibrational energy that came from the earth and that is ephemeral. This combination is what makes working with flowers extra special, therapeutic + uplifting and such a beautiful art form. What is your sign? How do you think that affects your work? Im a Taurus. I do identify myself with it because it is said that Taurus surrounds themselves with beautiful things and gathers energy from the earth. Also they say that Taurus is patient, I think I’m a very patient person, and enjoy the process of making, so much that I hate to be rushed! In addition to floral arrangements, how else do you express your art? I paint, and dye textiles, weave and will always be trying new things. It is important for me to create and experiment. I believe that when you experiment, is when you discover, and that is a great source of inspiration that can most likely have an influence on the other art forms I practice daily. What can we look forward to from Aurora Botanica this spring? New hand painted silks, hand-dyed textiles + weavings for this Spring. Id like to also create some natural perfumes inspired by different flower combinations and scents from nature, but this will most likely be later this year. Im also looking forward to the collaborative workshops that are in the works for Spring. " Cake styling for Luckybird bakes vanilla bean lemon zest 4 tier cake adorned with strawberries, chocolate cosmos, anemones, ranunculus, jasmine and hellebores. "It girls move on from magazines, PR, and the DJ booth to get down and dirty with Mother Nature..."
With Thanksgiving approaching, we asked Molly Guy, creative director of Stone Fox Bride, to help us create an abundant harvest table rich in color and textures for a dose of autumnal inspiration for our November issue. Guy, who is known for her lively, bohemian style, is not afraid of mixing, matching, and using unconventional pieces to throw a dinner party. Secret sources include Moroccan textiles and ottomans from Patina, which offers “chic odds and ends that create a cozy, colorful vibe” and eclectic tableware from L’Atelier Vert, including antique Limoges plates and mid-century silverware. To hit her floral notes, she turns toRawan Rihani, Stone Fox Bride’s floral designer, to create a low-lying garland centerpiece (so as not to impede the cross table view of your guests), rich in aubergine and burnt orange dahlias. And those blackberry pies from Luckybird Bakery look as good as they taste. Here, a slideshow of fall decorating ideas to get you in the Thanksgiving spirit. "....Rawan Rihani, a graduate of the Rhode Island School of Design who now focuses on floral art for Stone Fox Bride in SoHo, makes both fresh and silk crowns. She believes the trend has grown out of a desire to reconnect with the environment in a digital age. “You cannot help but feel like a goddess in a flower crown,” she said. “It’s just a small thing, but it changes your entire mentality when you wear it.”...."
“Flowers are not cheap,” says Rawan Rihani, the Floral Guru (yes, that is her title) at Stone Fox Bride in New York. There’s the volume aspect—150,000 orchids don’t come easily—and then there’s the fact that you can find just about any flower at any given time at a price. Sometimes a high one. “I’ve heard of people asking in the fall if they can get cherry blossoms and I’m like no. Or they will cost $30,000 for a branch. One thing I’ve learned is to just throw out a number so they can decide,” says Patterson....."
Vogue.com, "ArtBinder, Yvonne Force Villareal, Jemima Kirke, and Jose Parla Host a Summer Soiree", July 2014. ArtBinder, an app that lets art galleries showcase works and keep track of inventory, celebrated the launch of a new product, the ArtBinder Viewer, last night with a bohemian soiree that was right out of a midsummer night’s dream. With Alexandra Chemla as the hostess, it’s no surprise that the space, which was transformed into an exotic wonderland by designer Madeline Weinrib, was filled with Chemla’s closest friends and supporters, dressed in equally festive attire.Zani Gugelmann, Hayley Bloomingdale, Indre Rockefeller, and Natalie Joos in Gypsy Nation Vintage, all kept cool in shades of white and ivory on what may have been one of the hottest nights of the summer yet. Jennifer Fisher and Athena Calderone posed cheek to cheek in their Stone Fox Bride flower crowns, crafted by Rawan Rihani, who was on site making custom crowns for the evening.Natalya Poniatowski and Claire Distenfeld glided across the vintage Moroccan flatweave dance floor in floor-length dresses like Shakespearean heroines whileHannah Bronfman and Valerie Boster watched a performance by Katie Schecter.In between greeting guests like Jemima Kirke, who opted to go flower crown–less, Chemla, in Carolina Herrera, stole a moment to take in the scene. “I sent over a few inspiration boards and said, ‘You guys do you’,” Chemla said of her vision for the space and working with Weinrib and Stone Fox Bride. “It’s really not meant to feel Moroccan, it’s more like an integration,” said Weinrib. “I’ve always felt when you hear the word bohemian that’s part of what it is—mixing in different ethnic elements.” As guests meandered among the carnations suspended from the ceiling like pom-poms, the sounds of a Spanish guitar accompanied the wind-down of the evening.